PHOENIX – The 6-mile South Central Light Rail Extension not only will provide transportation through South and downtown Phoenix, it also will honor the diverse people and cultures that make South Phoenix such a vibrant community. 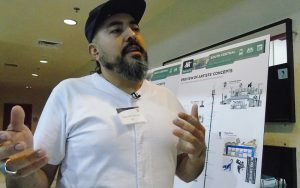 Fortoul is one of 150 artists who responded to the Valley Metro Rail Board‘s nationwide search for artists to design cultural art installations at each stop. With the help of South Phoenix residents, 14 winning artists were chosen. Ten of the 14 are from Phoenix. 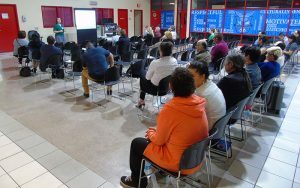 At last weekend’s meeting of Valley Metro and Phoenix officials, seven of the 14 artists presented some of their initial art concepts to South Phoenix residents. After, the artists spoke with residents to answer questions and take suggestions for their concepts. 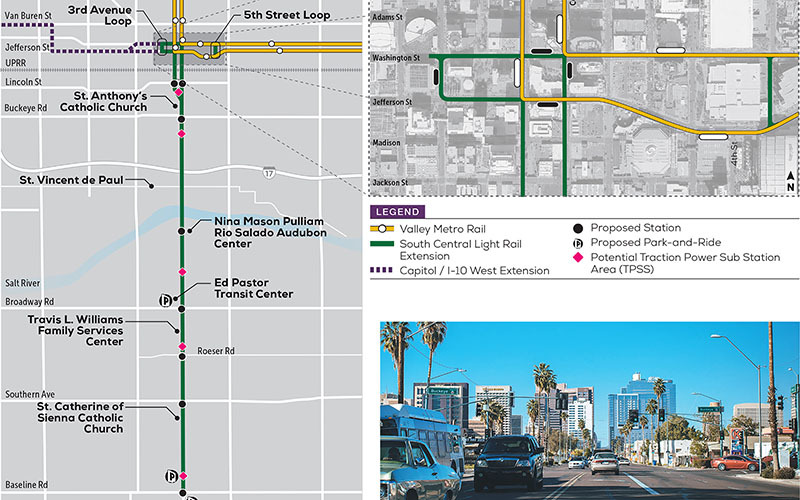 The extension, slated for completion in 2023, will move along Central Avenue from the existing light-rail system in downtown Phoenix to Baseline Road. The extension could lead to an increase in jobs and boost local businesses as they become more accessible. “This is a neighborhood improvement project in itself,” said Julie Cruz Gilfillan, Valley Metro community outreach coordinator. She noted the deeply rooted history and diverse culture of South Phoenix. “Throughout the process, we want to make sure that we are including the community and working with them along the way,” she said. Eva Olivas grew up in South Phoenix and is executive director of the Phoenix Revitalization Corp., which covers South Phoenix. She calls the extension crucial for the area. Olivas wants to see the 14 artists “embed the feeling of neighborhoods into the light-rail station” after years of underrepresentation. “Not just the history from 100 years ago, and not just about what could come in 100 years, but what’s here today,” she said. The “South Side” has a history of low-income households, especially within its large Hispanic and African-American populations. In 2015, the U.S. Census Bureau found that the 95th percentile of Phoenix’s household income makes about $175,000 and in South Phoenix, $128,000. The middle percentile of household incomes in Phoenix are $47,000 and slightly lower in South Phoenix at $42,000. Moreno and his artistic partner, Emily Costello, have lived in South Phoenix all their lives. Moreno and Costello’s art installation will be made of standalone cutout steel, framed with hand-painted tiles. 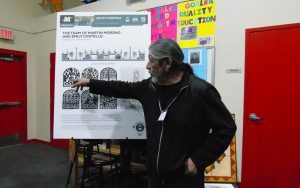 They will design panels with six designs representing cultures and concepts of South Phoenix: The African-American community, the Native American community, education, religion and faith. The two artists said they want to make the public a part of their work and are planning to invite South Phoenix community members to paint the tiles in future workshops. Valley Metro board members said they will consider safety issues before approving the projects for final installation. Many artists and project members, including New York artist Mark Reigelman, said it’s rare for members of the public to get so involved in a development project.